It’s not uncommon for critics of the Jesus story to cite the Telephone Game as an analogy for why we should doubt the information we have about him. In the Telephone Game, a group of children sit in a circle. The first kid whispers a sentence into the ear of the second, the second whispers it to the third and so on. When the last kid compares notes with the first one, the original sentence has often been warped beyond recognition. 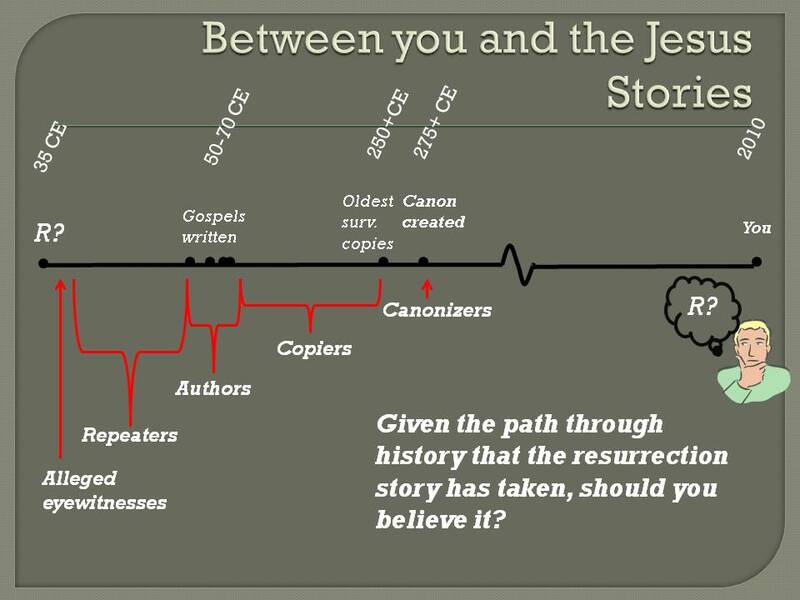 The analogy is supposed to be to the long series of people that the Jesus story passed through from the alleged eyewitnesses, to those who repeated the story, to the authors of the Gospels, to the scribes to copied the Gospels that we have now. We can’t trust the information coming out of this conduit to be the same as the information that went in. The response to the Telephone Game analogy by historically minded Christians has been to argue that for various reasons, the process that preserved the Jesus story would have been highly accurate so our worries are misplaced. I won’t review the specifics of the argument here. A superficial grasp of the argument that I’ve been making might liken it to the Telephone Game criticism. But as I see it, the Telephone Game doesn’t begin to scratch the surface of the multitude of obstacles that stand between us and accurate information about what, if anything, happened with Jesus. 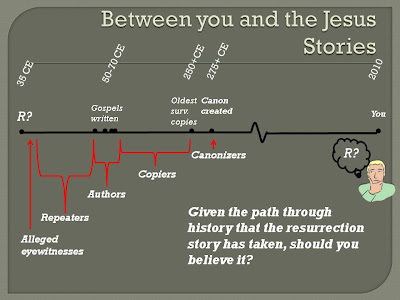 We can divide the layers of interference into five groups: the alleged eyewitnesses to Jesus’ resurrection, the people who heard the story from them and repeated them until the authors of the Gospels wrote them down 30 to 100 years later, the athors of the Gospels, the copiers who copied and recopied the stories over the next two centuries, and the canonizers who made a deliberate effort to cull one particular narrative about the life and death of Jesus out of thousands of early Christian writings that were circulating around until the Christian Bible as we know it was formed. That’s Alleged Eyewitnesses, Repeaters, Authors, Copiers, and Canonizers. I’ve been arguing on this blog that there are a variety of doubts we should have about every one fo these stages of the history of the story. Some of these doubts are fortified by recent psychological research, some of them are corroborated by Bible scholars, some of them are epistemological, and some of them are probabilistic. 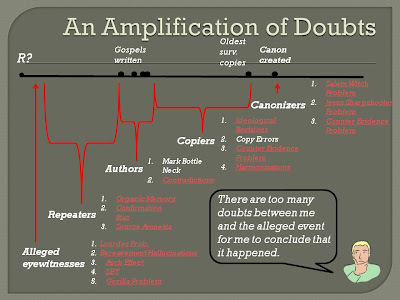 So here’s a time line that gives us a representation of these layers and some of the doubts that I have raised about their fidelity in transmitting the Jesus story. In my version of the Telephone Game, there are thousands of people in the chain, spread over many centuries. Many of them are illiterate, Iron Age peasants. Some of them are suffering from bereavement hallucinations. Some of them are apparently having epileptic seizures complete with religious visions. Many of them are deliberately discounting any information that they receive that does not conform with the account of Jesus that ends up in the Christian Bible. They refuse to pass on any other information, and they even go out of their way to destroy those accounts so that no one else can have access to it. They are deeply committed religious converts. They are subject to a variety of psychological effects and fallacies like the Asch effect and confirmation bias that they would not have been aware of. Many of their memories actively reorder, reimagine, and retell the events that they are repeating. Many of them are highly disposed to accept wild, supernatural and magical accounts of spiritual forces at work in the world because they don’t know of any better way to explain things they see. They lack education, hence they are highly prone to superstitions and religiousness. They are notoriously bad eyewitnesses. And they are remarkably unreliable, like other humans, at accurately reporting the occurrence of miraculous events. So now, with this embellished picture of a huge circle of humans and their various problems in mind, what shall we think are the odds that a piece of important information that is fed into the system at one end will be accurately and completely transmitted to the other end? One thing we need to know to answer that question is a simple point from probability reasoning. I won’t make things tedious by trying to put an actual number on the fidelity of the each of the layers of interference. But the Lourdes Problem—the general unreliability of humans giving miracle testimony—is significant. Even by a very conservative estimate, the vast majority of cases of human miracle testimony are false. Even a dedicated believer would have to concede that when people typically claim that some miraculous event or divine intervention has occurred, there is a better explanation. It would be exceedingly generous to put the accuracy rate at 1/100. It would still be generous, given how effusive humans are with miracle claims, to put the rate at 1/10,000. The Lourdes example suggests it should be orders of magnitude lower than that. 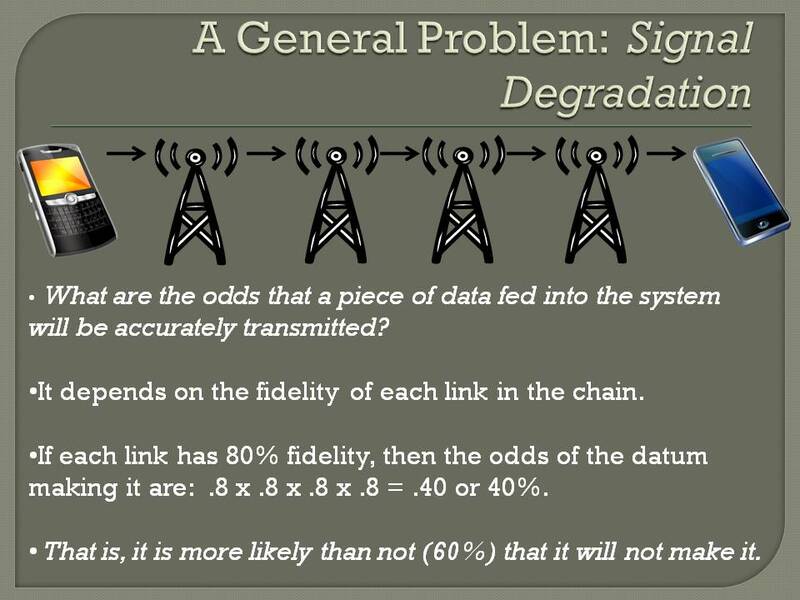 So if a reliability rate of .001, .00001, or .000000001 is appropriate, the effect of this number alone on our signal degradation estimate will be devastating. 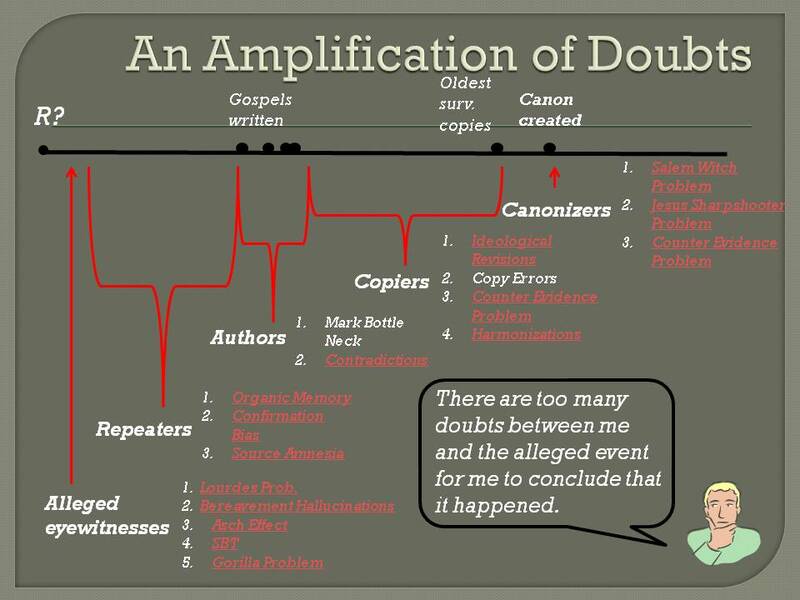 That is, the cumulative effect of all of these layers of doubt is to undermine our confidence that the resurrection really occurred. The Lourdes effect alone is sufficient to lead us to reject the historical resurrection claim. 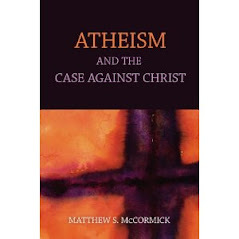 There is a staggering burden of proof facing anyone defending the historical case for Jesus. And it will not be met with the paltry provisions of the Bible. Those are really great diagrams. I think they should help people to visualise the problem with basing certain fundamental beliefs (about the meaning and purpose of their lives) on historical events like this. I am curious as to whether you have ever looked into the spread of urban myths (such as those covered on snopes.com) and the potential parallels with religious myths. I think they are also great examples of how false stories can get a foothold in the popular consciousness, even when they have been debunked. I've had several friends tell me that they knew people who had had their kidneys removed by criminal gangs or who had been sitting opposite a dead person on a train. Both stories are well-known urban myths and yet people are adamant that they knew people it had happened to. Translate this phenomenon back to the first century AD when we didn't have snopes.com and we're in a serious epistemological mire. Anyway, there's probably something wrong with that argument. I'm really just thinking out loud here. Having read a bit more, I guess what I am talking about is covered by the phenomenon of "source amnesia". This is a great post. I know that many Christians will say that it doesn't undermine the "message" of the resurrection, but I don't think that's what you're aiming at. I experienced something very similar in the real world this last week. I sing in a cathedral choir - I'm no longer religious, but I do love the music and the experience of making music - and was asked to speak on a couple of occasions to help raise funds to renovate the organ. Because the music is important to me, I agreed. The head of the fundraising committee interviewed me for about a half hour on what I enjoy about being at the cathedral and why raising funds for the organ is important. I spoke about the experience of making music and the beauty of the building. She then gave the recording of the interview to one of the assistant priests so that he could craft a script (which I can and will edit) for me to deliver at the fundraising events. A couple of weeks later, the script I was given, which was supposed to be based on my words, bore almost no relation to what I said. Facts about how long I have been part of the choir were wrong. Facts about my role in the choir were wrong. There was lots of talk about god - I didn't mention god or spirituality even once in the interview. And it bore almost no relation to my style of speaking. I think this served as a great example of what you demonstrated in your post. These people no doubt had the best of intentions, but they heard and wrote what they expected to hear, and what they thought others would like to hear. JD and Andrew, thanks. Yeah, JD, I've discussed the spread of urban mythology and the whole meme angle in my Critical Thinking classes for years. So I plan on hitting this point very hard. We have a lot of information about how gossip, rumors, stories, and myths spread among people now. Those points apply even stronger to a group of Iron Age peasants and fishermen who can't read or write, and whose world would be populated with lots of magical and spiritual forces. Andrew, I take your point. If someone doesn't believe in the literal return of the living body of Jesus and instead they think there's a valuable message in the resurrection, these points won't move them. They've already made the right first step. But I'd also argue that the message of the resurrection is morally bankrupt and misanthropic. Humans are intrinsically corrupt and are in need of some sort of divine gift to straighten them out. This is just a baffling and backward as literalism about the resurrection. This just occurred to me. I'll probably get a lot of resistance to various parts of this argument from Christians at the debate. But I suspect that if I was a visiting preacher who presented a parallel argument for why we should not believe the historical evidence for the origins of Islam with Mohammed, or undermining the historical evidence in favor of Mormonism, the audience would be quite satisfied with the argument. That will make a nice point. "But I suspect that if I was a visiting preacher who presented a parallel argument for why we should not believe the historical evidence for the origins of Islam with Mohammed. ... That will make a nice point." I'd love to watch the back-flips they do trying to convince you that it's different for Christianity somehow. Excellent post Matt. I think you need to add one more layer to this between the canonizers and us: the translators. Most of us cannot read the original language and even those of us who can cannot possibly understand first century greek as well as those for whom it was their native tongue and lived under first-century Roman rule. So I think you could make two points: 1) Modern bible translators may translate things in a way that is misleading (See Hector Avalos, "The End of Biblical Studies"for more on this). and 2) Discuss some of the problems with translating an ancient language into modern English (for example, the exact meaning of some words is not known with certainty). These won't be the weightiest considerations that we have to make about whether we can trust the Jesus stories, but they are still there and are still worth discussing. Thanks, AIG Busted. These are good points. My primary target is the resurrection. If there is insufficient grounds to prove the resurrection of Jesus, then it's not reasonable to believe in it. And if it's not reasonable, then the entire edifice of Christianity is built on a mistake. While your translation points are good, they don't pertain as strongly to the question of the resurrection. There doesn't seem to be much divergence of views about how to best translate those passages, and different translations and the original language copies are readily available to everyone. So that doesn't seem like the best place to undermine the resurrection story. Thanks. DM and Atheismwar, your patronage is appreciated. And if you've got some constructive and thoughtful comments to make about the topic under discussion, that would be great. But ranting threats about the imminent demise of atheists aren't welcome. Give us some reasons to change our minds, not threats. I have two questions relating to your argument. 1) Are you going to break down the "repeaters" as more than one level in your telephone game? 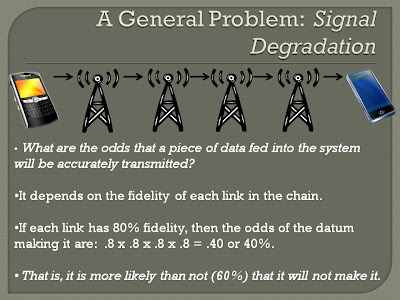 The idea being that each person who repeated the story degraded the information for the next, and we have no idea how many repeaters there are. 2) I know this is a much smaller point, but during the canonization part will you be speaking about the potential changing of the story to account for various political interests at the time? Ie, the Roman empire becoming accepting towards christianity in the 4th century. Good questions MH. Here's the deal. We really don't know how many people intervened and repeated the story between the alleged eyewitnesses and the authors of the Gospels. We don't know how many different people the authors talked to. And we don't know how many of those repeaters talked to each other. So it's hard to say exactly how much distortion we should expect from the this phase of the transmission. I think listening to people gossip and repeat stories now tells a lot. People unknowingly modify their memories, they add details and take them away, and they alter their stories in response to other things they hear and as time goes on. So we would expect the story to morph and mutate as it spread across the area. Listening to urban myths like the claim that Obama is a muslim or he's not an American citizen gives us some idea how outrageous and tenacious these mythological memes can be. And matters are made worse by the fact that we're talking about a bunch of illiterate Iron Age farmers and peasants who would have seen supernatural and spiritual forces and significance in everything. So I think even just sticking to the stuff we know about them, we can draw some conclusions about how unreliable they would have been at relaying the information. Is your argument targeted only at biblical inerrantists? Or do you mean it to address also those who think the Bible is imperfect, but largely reliable? I ask because if you mean to address both, then you need to give some probability calculations which tell us how much of the bible is likely to be unchanged (say, the percentage of sentences we could expect to be unaltered). If I were one of the latter crowd, I don't think your argument would both me (perhaps I'd be aware that the bible might be unreliable, but without your figures to force the point, I wouldn't shift from my original position). This is excellent and you are right on target. 2 considerations: 1) Some will say that if what you are saying is correct, we can know nothing about ancient history and very little about more modern history, this objection needs to be anticipated and answered. 2) While your opponent may not raise it, some Christians have argued that the telephone game is a completely erroneous analogy because of the Jewish method of passing along oral tradition. It is believed that they memorized the teaching of the rabbis verbatim and were careful to pass it down verbatim. While this may have been true of SOME Jewish disciples, to argue that it was true of Jesus' disciples is another matter. They were fishermen, "blue collar" people if you will for the most part and had not been trained as some of the more educated and hand selected disciples of the leading rabbis had. A great source on Oral Tradition in general is Oral Tradition as History by Jan Vansina (Madison: University of Wisconsin Press, 1985). In addition, on the subject of Eyewitness Testimony, an article was just published this month rebutting the book by Richard Bauckham, Jesus and the Eyewitnesses. It is entitled: “How Accurate are Eyewitnesses? Bauckham and the Eyewitnesses in the Light of Psychological Research” Journal of Biblical Literature 129 (2010) 177-197.